None of the top three seeds were seriously pressed in their Class meet wins, and all have much better times from earlier meets. Sacred Heart's Edward Williams was 2nd at last year's meet, but the Class S winner has the best time in CT this year at 7.39 from a 1st at Yale. Reigning champ Deshaune Poole of Hillhouse again won Class M and has a 7.53 best from back in December. Amity's Richard Papa won in Class L at 7.69. Other guys expected to be in the mix for places include LL winner Osarentin Osagie of Norwich Free Academy, Aidan McShane of Masuk, Jonathan Lindsay of New Britain, and Myles Hall of St. Joseph. Korey Morton of Brian McMahon was 3rd in the Class LL meet after a CT #1 6.47 a week earlier in the FCIAC, so he will looking for a rebound. 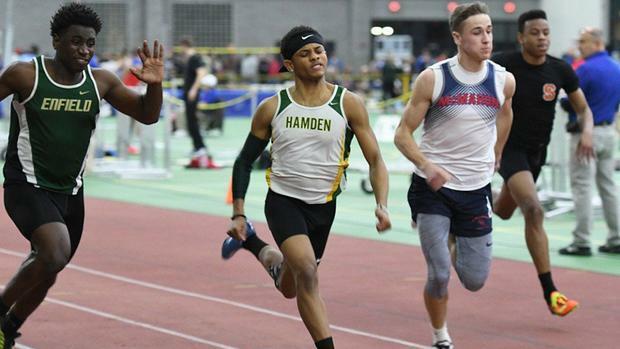 LL winner Christopher Pigatt of Hamden with a time of 6.50, S winner Kymali Hay of Bloomfield, and M champ Neal Eley of Hillhouse with a best of 6.53 will be among the favorites here. Others whose wheels should be productively spinning at a very fast rate include Joel Stewart of Enfield, Keith Berrouet of Sports Science, and Jaylon Nealy of Bloomfield. Meet Record: 34.10 Last Year's Winner: Kymali Hay (Bloomfield) 35.52. Reigning 55m hurdles champ Deshaune Poole of Hillhouse is the favorite in the 300m after a big win in Class M, and he has a season's best of 35.05. Class S winner Ja'kwan Hale of Derby has a season's best of 35.46. The runners-up in the M and S could also come up big, as Lyman Hall's Michael Toppin has a best of 35.66, and Kymali Hay of Bloomfield is the reigning 300m champ and has a season's best of 35.73. Others expected to be blazing the curves include L winner Tyler Cady of Fitch, LL winner Rodney Davis of Hamden, and L runner-up Warren Murphy of Notre Dame. Reigning champ Malcolm Going of Danbury gets another crack at the meet record after winning the LL race, and he has a 1:20.77 best this season from a win at Yale. A false step at the Class L meet eliminated Going's chief competition, Xavier's Pierre Sylvain, but five closely bunched guys battling for places here with bests around 1:24 include LL runner-up Simon Jupp (Ridgefield), the M race's top two of Jared Sharp (Suffield) and Talib McBride (Hillhouse), and L's top two of Jose Ramirez (Bristol Central) and Nathan Metsack (EO Smith).